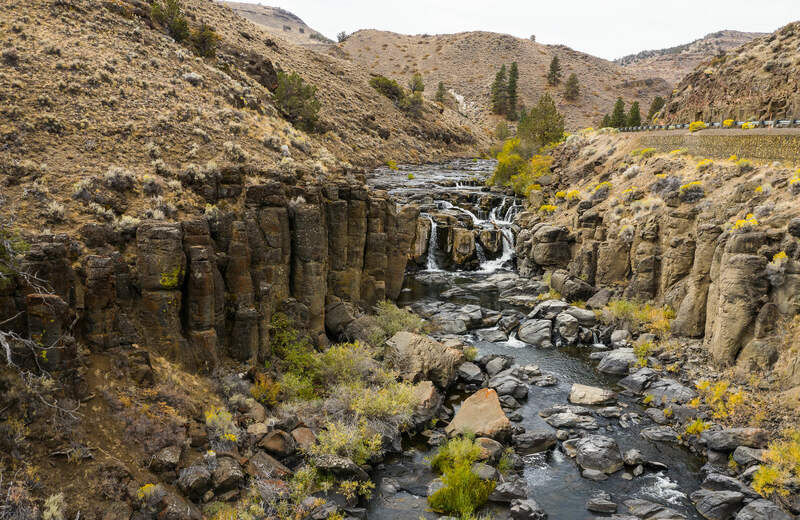 Something clicks when you first lay eyes on Oregon’s Outback. These wide-open skies and vast high desert can be pretty inspiring. Suddenly you’re ready to hike the inside of an ancient volcano or ride a remote world-class mountain bike trail. Your hours are soon spent exploring a national forest, an off-the-grid resort or shops filled with Old West memorabilia. Worries fade away and ambition kicks in. And after a day of outback adventures, there’s nothing like soaking in a natural hot spring under a starlit sky. Welcome to your next great adventure. Spend three days (or more) in this land of basin and range, history and innovation, culture and quiet. Follow this itinerary for an extraordinary escape. It’s time to hit the road. As Highway 30 splits from OR-97 south of La Pine and becomes the Oregon Outback Scenic Byway, the landscape changes too. The pine forests give way to plains of juniper and sagebrush and a volcanic beacon appears on the horizon: Fort Rock. Arrive at Fort Rock State Natural Area, approximately 31 miles down OR-31 and on the paved County Road 5-10. Fort Rock, a National Natural Landmark, looms 325 feet above ground, resembling a powerful stone fortress (as its name suggests). Really, it’s the tuff ring of an ancient volcanic crater that sat in a shallow sea many millennia ago. Explore Fort Rock’s inner outcropping on a moderate 1.7-mile loop hike leading to panoramic views. Come June red paintbrush wildflowers pop up amidst the sagebrush and yellow rabbitbrush appear in the fall. You’ll probably want to bring a camera. Also wear hiking shoes suitable for rocky terrain and be watchful for possible snake sightings. History runs deep at Fort Rock. 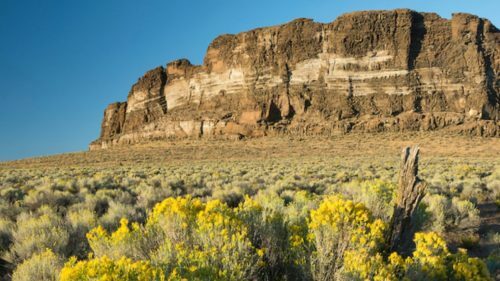 There’s evidence of ancient humans here dating back more than 10,000 years at nearby Fort Rock Cave — where scientists discovered more than 70 prehistoric sagebrush bark sandals, including a pair believed to be the oldest known shoes in the world. (They’re now on display at the Museum of Natural and Cultural History at the University of Oregon.) Guided tours of the cave are available through Oregon State Parks. Further exploration beckons east at Derrick Cave, considered to be Oregon’s third-longest lava tube cave. It’s only fitting to visit the town of Fort Rock next. Fuel up with lunch at Fort Rock Restaurant and Pub or The Waterin Hole Tavern, both located a short drive from the park. The friendly restaurateurs can provide directions to Crack in the Ground and other local attractions, as well as share where to find maps. If time permits, check out Fort Rock Valley Historical Homestead Museum, featuring authentic pioneer houses, stores, church and school. Follow the signs along Christmas Valley Highway for Crack in the Ground, an ancient volcanic fissure that formed thousands of years ago. At parts the crack is more than 30 feet below ground. The 2-mile trail along the crack is truly a one-of-a-kind hike, with temperatures as much as 20 degrees cooler than the surface. Again, you’ll want to wear sturdy hiking boots, and for safe measure when above keep a distance from the edges of the crevasse. By now, you’ve earned a big dinner — or a feast. Luckily the legendary Cowboy Dinner Tree fits the bill with its 22 oz. steaks, whole broasted chicken, hearty bean soups and old-fashioned sweet yeast rolls baked in a cast iron pan. 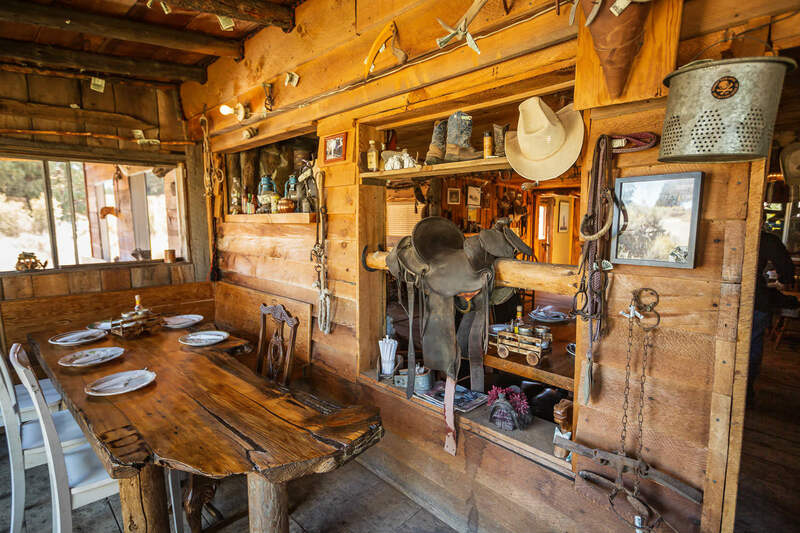 It also might be the most unique Western dining experience, from the heaping plates of food and lasso games to the “outback chic” decor featuring antique tools and ranch gear. Dinner reservations are required well in advance, and the onsite cabins book up fast. Plan for at least two hours of dining and more at Cowboy Dinner Tree. Kudos if you remember to don a Stetson; you’ll fit right in. 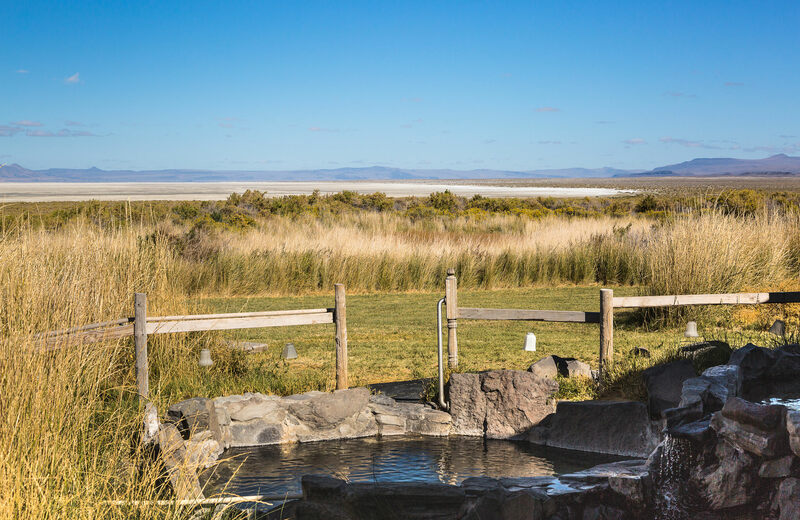 There’s no better way to end the day than soaking in a natural hot spring under a blanket of stars. The calming mineral waters of Summer Lake Hot Springs have relaxed guests for decades. A large indoor pool steams inside its original 1920s tin house, while other hot springs are found outside on the 145-acre resort. Note that clothing is optional after 9 p.m. Spend the night at Summer Lake Hot Springs in an uniquely designed cabin or vintage Airstream trailer. As one might guess, the lodging here is pretty popular, so be sure to book early and check for any minimum-stay requirements. Alternatively, you can stay at Cowboy Dinner Tree or Harris Cabins in Silver Lake. Rise and shine — and soak. Start the morning in the peaceful warm waters at Summer Lake Hot Springs. Once you’ve mustered up some energy, ask the owners where you can find the petroglyphs nearby. Then it’s off to Paisley for breakfast. The Western-style storefronts of Paisley might make you feel like you stepped back in time. Kick up your heels and dig in to breakfast at The Pioneer Saloon, a local landmark that first opened in 1883. After your stomach is satisfied, grab some coffee to go at the Paisley Perk and head towards the town of Lakeview. 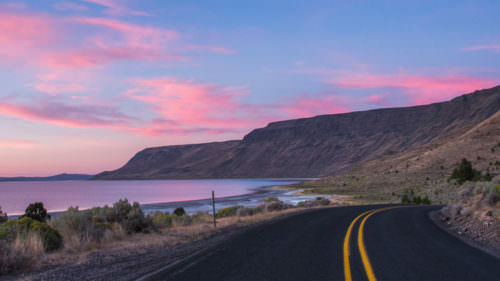 Along the way, you’ll pass a connecting route for Lake Abert, Oregon’s only saltwater lake. Neighboring Abert Rim is one of the highest fault scarps in the U.S., making it a popular spot for hang gliding. If time permits, you might want to check it out. In Lakeview, refuel on gas and pick up a tasty pack-lunch at Happy Horse Deli. Then it’s time to hit the mountain bike trail. Make your way up the mountain to find Rogger Meadow, a launch point into the Fremont Tier of the famed Oregon Timber Trail. 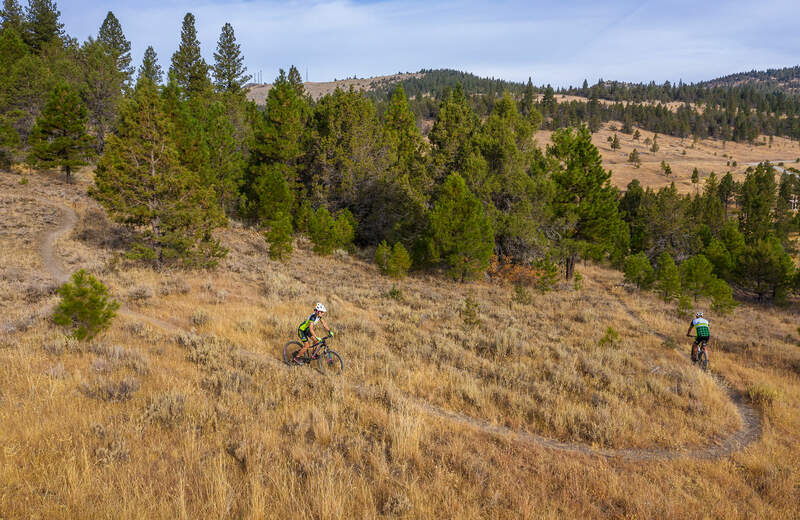 In all the trail features 670 miles of backcountry mountain biking — truly epic for long-haul bikepackers and weekend riders alike — of which the Fremont Tier lays claim to 207 rugged miles of panoramic ridgelines, fire tower lookouts and valleys bursting with wildlife. Even if you don’t have time to conquer the entire Fremont Tier, it’s worth hitting the trail for a few hours to see why it deserves so much fanfare. For hikers, the Fremont-Winema National Forest has plenty of fantastic options. Take the Cottonwood Trail System for by foot or horseback to explore beautiful groves of quaking aspens and ponderosa pines. Or outside the forest, head east of Lakeview to Deep Creek Falls, a spectacular waterfall plunging down the steep cliffs of Gibson Canyon. If ATV riding is more your style, there are several OHV-designated trails in the Fremont-Winema National Forest. It’s also legal to ride your ATV through the streets of Lakeview to Bullard Canyon and the Crane Mountain OHV trail loop. After an active afternoon, you’re bound to be ready for a great meal. At Julia’s on 395, indulge in steak, salmon and pasta with a generous glass of wine. (You earned it.) This is cattle country, so be prepared for a large cut. Also save room for Julia’s famous flourless chocolate cake — many locals swear it will change your life. Or if you’re craving a more sociable experience, grab the gang and head to TJ’s Family Fun Center. Sink your teeth into a burger or an Instagram-worthy rainbow grilled cheese sandwich before challenging each other to a bowling match. Dreamed of staying in a lookout tower? Now is your chance at Drake Peak Lookout, located on the crest of the Warner Mountain Range in the Fremont-Winema National Forest. The compact space accommodates up to four people and has a small propane stove, but you’ll need to bring your own food and water. Reserve well in advance, since availability can be limited, and enjoy the remote nature just outside your door. For RV and tent camping, spend the night at Junipers Reservoir RV Resort, with free wifi, showers, propane barbecues and endless outdoor recreation nearby. 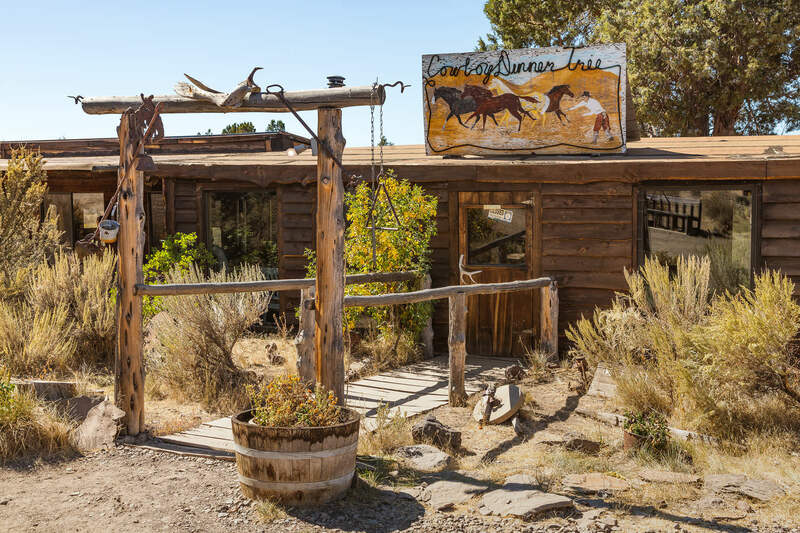 The family-owned resort is set on a working cattle ranch, so you’ll get a taste of the Old West lifestyle while sipping coffee and watching wildlife. Other suggested stays include Deep Creek Campground, Cottonwood Campground and Aspen Cabin, a historic log cabin in the national forest. Wherever you choose to stay, be sure to look up to the sky for a spectacular show of colors during sunset. That and a night of unbelievable stargazing are why so many people love spending the night in Oregon’s Outback. Greet the day with breakfast at Tall Town Café and Bakery. 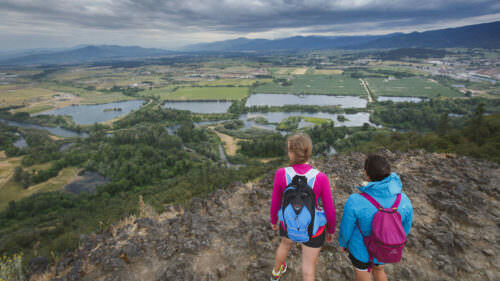 (At 4,800 feet, Lakeview has the highest elevation of any established town in Oregon.) The cafe’s homestyle food comes with rave reviews for good reason — so feel free to order to your heart’s desire. Next relish in Oregon’s Old West history at two prized local museums. Housed in a 1927 building, the Lake County Museum displays the region’s rich local history, from indigenous artifacts to genealogy files. It’s open May through October, Thursday through Saturday. The Lake County Fairgrounds is home to the Round-Up Museum, a tribute to the famed Lake County Round-Up, with historic photos, hats, chaps, saddles and Round-Up queen outfits on display. Mark your calendar: the rodeo turns 100 years old in 2019, and celebrations will culminate over Labor Day Weekend. When lunch calls, there are several places in Lakeview to land. Happy Horse Deli has a reuben sandwich worthy of its own blog post. Jerry’s Restaurant is a local gem, serving everything from fluffy pancakes to savory steak and mashed potatoes. Or chow down burgers and beer alongside cowboys, Eagles Nest Food and Spirits. Though your time in Oregon’s Outback surely won’t be forgotten, a little souvenir shopping might be in order before you go. In downtown Lakeview, Howard’s Pharmacy doubles as a gift shop, where you can snag your tallest town coffee mug. Go antique hunting a couple blocks away, or enjoy a wine tasting at Back Yard Floral and Wine. For home decor (and good company), check out Bloomers Country Nursery. The Red Barn Boutique is a visitor favorite, with a wide variety of country-style decor and clothing. 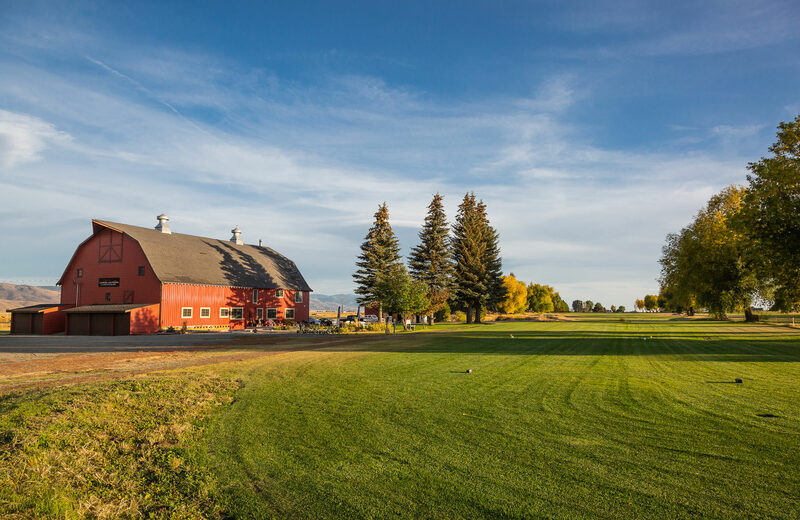 Bonus for golfers: Red Barn also serves as the clubhouse for Lakeview’s local 9-hole golf course. Three days fly by fast when you’re having this much fun. Take a moment to reflect on your adventure-packed trip before you head home. Leaving is probably a bittersweet feeling, but don’t worry. Oregon’s Outback will still be here, as it has been for centuries.